We've already taken a close look at the 24" HZ24W and 26" HZ26W models recently, and now Hazro have sent us the massive 30" HZ30W display. The biggest model in their current range remains faithful to the design and features of its little brothers, and importantly Hazro have kept the S-IPS panel from LG.Display (this model features the LM300WQ3 panel). The use of S-IPS has already attracted a lot of attention for this display newcomer and helps secure a niche in the market where TN Film panels are becoming far more common place. S-IPS has long been the choice for colour enthusiast screens and many people will settle for nothing else in their quest for the ultimate screen. More on the pros and cons of S-IPS as we go through this review, but it's promising to see a manufacturer paying so much attention to detail and to what their customers want. The Hazro website states: "The Hazro HZ30W builds industry zenith technology on the foundations of good design. For the professional, creative boundaries need not be restricted to poor resolution and narrow view-angle. Experience Super-IPS panelling with 2560x1600 pixel resolution, and enhanced design. Experience 178-degree panoramic perspective, with unspoilt visual quality. Experience Hazro. Lead the field with the Hazro HZ30W Professional Monitor. Giving three times the workspace of a standard 19” monitor in unrivalled clarity and colour, the HZ30W enables creative freedom and practicality; from the office block to oil rig to construction site. Wherever you need it most, the Hazro HZ30W performs with consistency and clarity to optimise your visual experience. A superior resolution and enlarged workspace combine to create the ultimate work environment. The Hazro HZ30W recognises groundbreaking technology without compromising efficiency, whilst tailoring to the needs of the discerning, professional, user. The masterful design outside augments the genius within, with the Hazro HZ30W collating top industry-spec innovation with rock-solid dependability to perform when you need it most, time and time again." The HZ30W follows in the footsteps of the 24" and 26" models we have already tested, offering an all-aluminium design and coming in either black or silver colour. 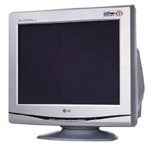 In terms of ergonomic adjustments, the screen is limited, offering only a basic tilt function. It would perhaps have been nice to see a height adjustable stand, but features like rotation (portrait and landscape switching) are obviously pretty useless with a screen of this size anyway. That's not missed. The bezel of the HZ30W is a little thicker than that of the smaller models, with about an inch of aluminium all around the panel. The materials are of a very high standard and build quality is very good. The tilt mechanism is smooth and easy to use and the base feels sturdy underneath the massive screen. There is a small unobtrusive under-hang at the bottom of the bezel where a couple of operational buttons sit out of sight. There's the usual on/off button and an up and down arror which changes the brightness of the panel. There is no OSD menu on the HZ30W and instead, all adjustments must be made at a graphics card level. Calibration is still possible of course, since monitor OSD adjustments really only form a small part of the settings on other screens. You can still alter brightness, contrast and RGB levels via your graphics card settings, and colorimeters are obviously capable of further LUT adjustments and ICM profiling. At least the screen does offer brightness adjustment quickly and easily via the monitor, so you can adjust your screen in varying ambient lighting conditions if you want. At the back of the screen there are only connections for the power cord and dual-link DVI. It's worth noting that the screen uses an external power brick, and also that Hazro have included HDCP support over their digital DVI interface. No component or D-sub interfaces here, making it slightly different to the smaller models in their range. Make sure your graphics card features a dual-link DVI interface if you intend to buy a screen with this kind of resolution. As you would expect, the screen is Vista ready and features a power-save mode when not in use. The screen is VESA compliant (100mm x 100mm) and comes packaged with power and DVI cables. The aluminium finish is non-reflective and the materials all feel of a very high standard. Build quality is very good, and overall the screen looks impressive. The panel itself is a matt finish with anti-reflective coating being used (3H hard coating). The screen is the same design as the smaller models, so for more pictures, please see the HZ24W and HZ26W reviews. The Hazro HZ30W utilises an 8-bit S-IPS panel, capable of producing a true 16.7 million colours. The screen uses enhanced W-CCFL backlighting and so it's colour gamut covers 92% of the NTSC colour space. An important thing to consider for most users is how a screen will perform out of the box and with some basic manual adjustments. Since most users won't have access to hardware colorimeter tools, it is important to understand how the screen is going to perform in terms of colour accuracy for the average user. I restored my graphics card to default settings and set it to its standard profile. The HZ30W was tested at default factory settings out of the box using the LaCie Blue Eye Pro and their accompanying software suite. Since there was no OSD for the HZ30W, and there was only access to brightness but not contrast. I left brightness on its maximum setting as default. Out of the box, the performance of the HZ30W was quite poor, but this is in keeping with a lot of modern screens, especially where extended gamuts are being offered. On the left hand side of the above image you will see the familiar CIE diagram which shows the monitors colour gamut, represented by the black triangle. 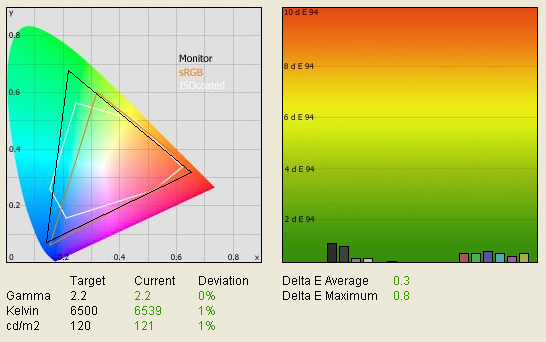 This fits outside the standard sRGB colour space represented by the orange triangle. This goes to show that the screen is using wide-colour CCFL backlighting and can offer a 92% coverage of the NTSC colour space as the specification lists. To the eye, the colours do look a little deeper and more vivid, particularly in green shades. This is also evident in the CIE diagram where the monitors triangle stretches outside the sRGB space most in green shades. Below this you can see the reported measurements for gamma, colour temperature and luminance in turn. 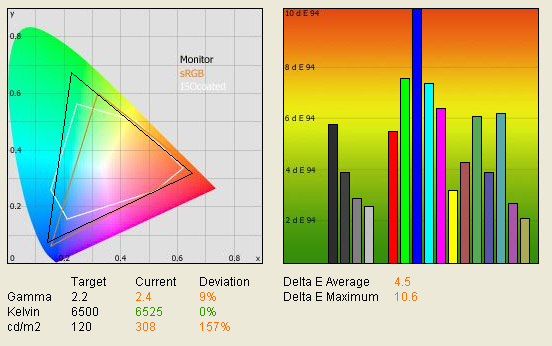 The monitors gamut at default setting is fairly accurate at 2.4, being only a little way out from the desired 2.2; this being the default for computer monitors, and the standard for the Windows operating system and the Internet-standard sRGB colour space. The screen offered excellent colour temperature at default settings, with a reading of 6525k, less than 1% out from the desired 6500k of daylight. Luminance on the other hand was far out from the desired 120 cd/m2, being the recommended setting for LCD screens in normal lighting conditions. This was recorded at a very high 308 cd/m2, even slightly higher than the manufacturer specified 300 cd/m2 maximum brightness. In practice, this was far too bright for prolonged working. With black depth being measured at a pretty respectable 0.39 cd/m2 this gave a static contrast ratio of 790:1, a pretty impressive performance for an S-IPS matrix, and not too far out from the specified (and perhaps slightly hopeful) 1000:1. In comparison with the smaller models, the HZ30W overall offered pretty comparable colour accuracy out of the box. The HZ26W was slightly better than the other two with an average dE of 3.4. The HZ30W we are testing here was actually the worst, with average dE of 4.5, but ranging up to discrepencies of 10.6 on the dE scale in some shades (blue in this case). We''ll have to see if calibration with our LaCie probe can improve things. During the calibration process I could only alter the monitors brightness via the operational buttons. I dropped the brightness control down to the minimum, and then used the setting 3 steps up. The contrast and RGB levels could not be adjusted during the following stages of the Blue Eye Pro calibration process, and so I proceeded to the automated graphics card LUT adjustments during the final stages. The LaCie colorimeter did all the corrections and an ICM profile was saved and activated. I was very impressed with the results i saw! Several of the shades were entirely accurate, with dE showing as zero on the graph! 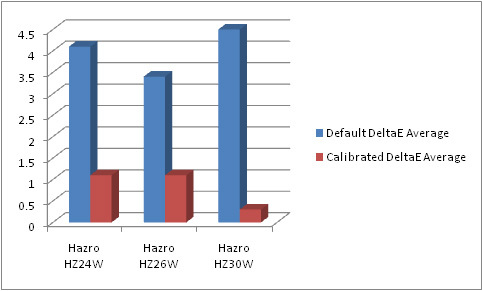 This was one of the most impressive results I have seen from a desktop display, and with an average dE of only 0.3 and maximum of only 0.8, the HZ30W was considerably better even than the smaller models in the Hazro range (see below). LaCie would classify the colour fidelity as excellent here. Gamma was corrected to 2.2, colour temperature remained very accurate at 6539k (albeit slightly further out than default settings) and luminance was corrected nicely to 121 cd/m2. Black depth was recorded at an excellent (for S-IPS) 0.24 cd/m2 giving a fairly respectable contrast ratio of 504:1. Testing the screen with colour gradients showed no banding or obvious gradation. As I said earlier, you don't need an OSD or adjustments at the hardware level in order to get excellent results from a screen. The colorimeter has done pretty much all the work here and the results from the HZ30W were excellent. Let's do some comparisons of our calibrated results from different models. This is the first 30" model we have tested here at TFT Central, and so we will offer comparisons with Hazro's other models, as well as some other large screens we have tested at 24" or above. Comparing the 30" model with the 24" and 26" shows that the largest screen comes out on top in all these readings! Black depth was far better from this 30" S-IPS panel than I had expected from my tests with the HZ24W and HZ26W. A reading of 0.24 cd/m2 was very admirable and considerably better than those of the HZ24W and HZ26W. In fact, it was on par with some VA based models we have tested in sizes of 24" and above! (see below). DeltaE average was extremely low, and overall the 30" model really does offer some excellent performance once calibrated, even kicking its smaller brothers into touch. 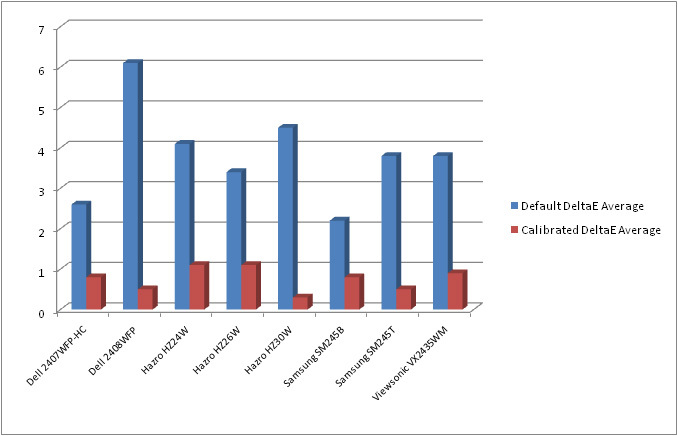 If we compare the default and calibrated dE average for several of our reviewed screens we see the above graph. As you can see, the HZ30W may not be particularly great at default settings in terms of colour accuracy, but once calibrated, the results are fantastic and unrivaled. Interestingly, the best colour accuracy out of the box comes from the TN Film based Samsung SM245B, a very impressive performance considering the 'budget' panel and very low cost compared with the other models here. If we compare the calibrated black depths of these models we again see that the TN Film panel of the SM245B offers the best performance (0.16 cd/m2 once calibrated). Obviously Samsung have done something right with this panel! 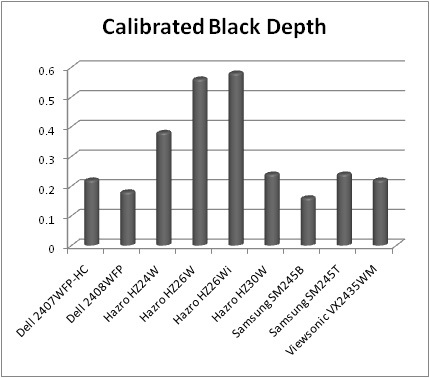 The purpose of this though was to show that the black depth of the HZ30W is actually very good, being very comparable to the S-PVA matrices of the Dell 247WFP-HC and Samsung SM245T. A decent result for S-IPS and perhaps a sign that the technology is improving in this regard. Viewing angles were as you would expect from an S-IPS matrix. Good field of view in all directions, and free from the annoying contrast and colour shifts of TN Film panels, and of the off-centre contrast shift you see from VA panels. S-IPS offers the best viewing angles of the mainstream panel technologies, and there were no issues here. There was a slight purple tint as you reached extreme angles (something which characterises S-IPS), but nothing which would cause any problems in real use. The uniformity of the panel overall was average, with the left hand side being slightly darker than the right (variance from about 108 cd/m2 to 123 cd/m2. The left hand side corners were the darkest points, but to the naked eye, in practice, there was negligible difference across the screen. Certainly no real issues in day to day use. In our usual testing process I viewed an all black screen in a darkened room, which allowed me to test the uniformity of the panel and to examine whether any backlight bleed was evident. The above image shows the uniformity in a darkened room. It should be noted that due to the sheer size of the screen, it is hard to accurately represent the backlight of the HZ30W. You should ignore the light patch on the right hand side of the screen, that is down to the camera and ambient light, and not an issue with the screen. The only detectable leakage was in the bottom left hand edge, where you can see a slight line protruding about a quarter of the way along the bottom. This wasn't really noticeable in normal use however. This is our first review of a 30" screen and it really is a staggering difference compared with the 'small' mnodels we have tested in the past. Even upgrading from a 24" model, which has long been my personal screen size, you feel overwhelmed by the sheet size of the HZ30W. You'll want to make sure you have a nice big desk for this screen, and be able to sit a comfortable distance away. Despite the massive screen size, the 2560 x 1600 resolution gives you a lot of resolution real-estate to play with, unlike similar sized LCD TV's. The pixel pitch is very 'tight' at 0.250mm (even less than a 20" screen in fact) and so text is small, but sharp and crisp. The resolution easily allows you to do some split screen work, and you can even divide the area up into 4 sectors and comfortably work with all of them! There are no monitor preset modes for "text" or "internet", so you will have to make sure you calibrate your default profile to a comfortable luminance. The default settings are overly bright, so that is the first thing you will want to change for any prolonged office use. The screen only features a DVI interface (dual-link), and so text is crisp and sharp. No complaints there. Overall, if you can handle the massive screen size and resolution, the HZ30W is very good for office use, giving you plenty of room for multiple documents and offering a good image quality along with it. The Hazro HZ30W was tested using the chase test in PixPerAn, a good bit of software for trying to quantify differences in real terms responsiveness between monitors. As a reminder, a series of pictures are taken on the highest shutter speed and compared. The images below show the best case example on the left hand side, and the worst case example on the right hand side. This should only be used as a rough guide to comparative responsiveness but is handy as a way of keeping a constant test of each screen. The HZ30W utilises a 12ms G2G rated S-IPS panel from LG.Display, using Response Time Compensation (RTC / Overdrive) technology to boost the response time of grey to grey transitions. This makes improvements over the previous non-overdriven generation of panels, which were stuck at an ISO response time of around 16ms. Grey to grey transitions were also much slower (and much more common than a full black > white change) and so responsiveness in practice was not as good. With the application of RTC, LG.Display have managed to improve responsiveness not only on paper, but in practice as well. As you can see from the above test images using the PixPerAn software, the performance of all three models is quite similar. All three use S-IPS panels with RTC, and the responsiveness is quite comparable. The HZ30W is very similar to the HZ26W in these tests, despite the fact that the HZ26W is quoted with a 5ms G2G response time. At the end of the day, there are minimal improvements as you move from one generation of overdriven S-IPS panels to another, and these tests show that. The 12ms G2G panel of the HZ30W performs very admirably with minimal ghosting and blurring. The HZ24W is actually a little better in these tests, showing a less noticeable trail image in the best case example (the left hand images). The panel in the HZ24W is rated at 5ms G2G again, but actually shows a better performance than the 26" version. Perhaps the RTC impulse is better implemented or controlled on the 24" model. If we compare the HZ30W against some other different screens we get an idea of its comparative responsiveness. As you can see, in practice, the 12ms G2G rated S-IPS panel here, which acts quite like a 5ms G2G rated panel in the other Hazro models, is quite comparable to the 6ms G2G S-PVA generation (Dell 2408WFP) and 5ms ISO TN Film generation (Samsung SM245B). There are differing response time specs, and differing panel technologies being used here, but when it comes down to actually using the screen, the 12ms G2G panel here performs just as well as some of the other screens. The bottom image is from the NEC LCD20WGX2, a 6ms G2G rated AS-IPS panel. This is widely regarded as one of the most responsive panels on the market, and has been our reference monitor for some time. One other thing to bear in mind is that you will need a very powerful graphics card to run this screen at its full 2560 x 1600 resolution in modern games, especially if you want details and eye candy turned up high. The screen does not feature hardware level aspect ratio control which is a shame. You will have to use software level control for this if you can. 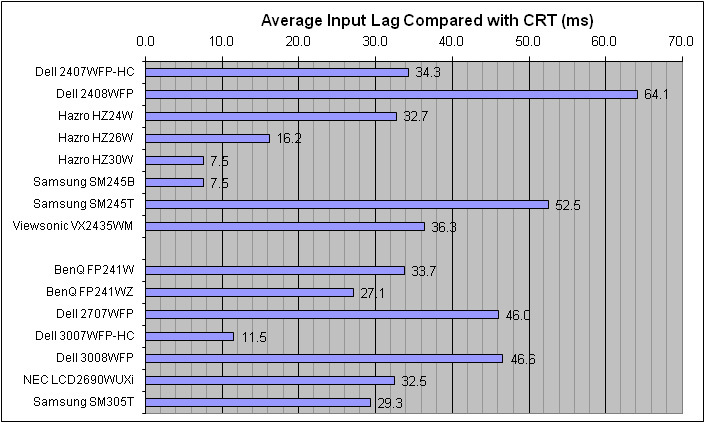 The above graph shows that average input lag was 7.5ms on the HZ30W. Commonly the lag was 0 - 20 ms, but there was the odd image which showed a lag of 30ms. This was infrequent however and didn't impact on the average lag much. In practice I doubt many users would see any adverse affect of the input lag here at all, and it's the joint lowest we have tested, being on par with the Samsung SM245B. At the moment, the screen retails for ~£845 GBP, and is only available in the UK at this time. This puts it at a very competitive price compared with other manufacturers 30" offerings, including the Dell 3008WFP (£985), NEC LCD3090WQXi (£1526) and Samsung SM305T (£940). I was very impressed with the HZ30W's colour performance once calibrated, offering some of the best colour accuracy we have seen here, and even aa decent black point. It's a shame that default accuracy was quite poor, but if you are investing as much as this in a new screen, surely you can afford a colorimeter device as well! Responsiveness was good, and input lag was very low and in theory this should make it a good screen for gaming as well. However, the massive resolution will need a very powerful graphics card to run games, so perhaps this screen isn't really a gamers screen at the moment. Not until graphics cards improve and resolutions this high become more common. Overall I was very impressed with the performance of the HZ30W, with perhaps the only obvious drawbacks being the lack of additional interface options, and minimal ergonomic adjustments. The panel seemed to show no real problems and was a decent overall performance from S-IPS I felt. If other S-IPS panels can follow suit in terms of their black depth, I'm sure they will attract even more potential buyers than they do now.